(Nanowerk News) SLAC and Stanford scientists have set a world record for energy storage, using a clever “yolk-shell” design to store five times more energy in the sulfur cathode of a rechargeable lithium-ion battery than is possible with today’s commercial technology. The cathode also maintained a high level of performance after 1,000 charge/discharge cycles, paving the way for new generations of lighter, longer-lasting batteries for use in portable electronics and electric vehicles. The research was led by Yi Cui, a Stanford associate professor of materials science and engineering and a member of the Stanford Institute for Materials and Energy Sciences, a SLAC/Stanford joint institute. 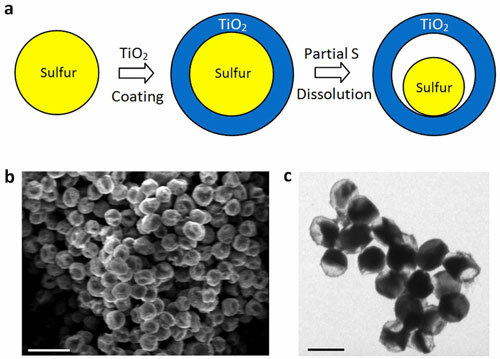 The team reported its results Jan. 8 in Nature Communications ("Sulphur–TiO2 yolk–shell nanoarchitecture with internal void space for long-cycle lithium–sulphur batteries"). Lithium-ion batteries work by moving lithium ions back and forth between two electrodes, the cathode and anode. Charging the battery forces the ions and electrons into the anode, creating an electrical potential that can power a wide range of devices. Discharging the battery – using it to do work – moves the ions and electrons to the cathode. Today’s lithium-ion batteries typically retain about 80 percent of their initial capacity after 500 charge/discharge cycles. Cui’s innovation is a cathode made of nanoparticles, each a tiny sulfur nugget surrounded by a hard shell of porous titanium-oxide, like an egg yolk in an eggshell. Between the yolk and shell, where the egg white would be, is an empty space into which the sulfur can expand. During discharging, lithium ions pass through the shell and bind to the sulfur, which expands to fill the void but not so much as to break the shell. The shell, meanwhile, protects the sulfur-lithium intermediate compound from electrolyte solvent that would dissolve it. Each cathode particle is only 800 nanometers in diameter, about one-hundredth the diameter of a human hair. “It basically worked the first time we tried it,” Cui said. “The sulfur cathode stored up to five times more energy per sulfur weight than today’s commercial materials. Funding for the project came from the DOE Office of Basic Energy Sciences through SLAC’s Laboratory Directed Research and Development Program, which directs a percentage of the lab’s funding to high-risk, high-payoff research that, if successful, can lead to future program opportunities. The group’s next step is to combine the yolk-shell sulfur cathode with a yolk-shell silicon anode to see if together they produce a high-energy, long-lasting battery.